Choose leeks that have dark green leaves. They will then be straight, thick-leafed and very crisp with white bulb-ends. Avoid picking leeks with yellow, brown, wilted or slime-spotted tops. 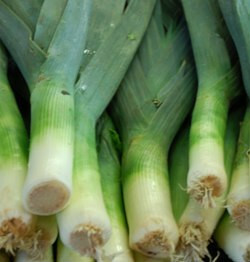 Leeks are used in soups, salads, stir-fry’s and are great in omelets.